Well here it is, my first non-apple parody video (they said it couldn’t be done!). This video was first created when iOS 6 first came out, to comment on the Apple Maps fiasco. Unfortunately I had problems with the singing, so the release got delayed until now. Oh look, Apple has a new product launch this week. I guess that means it’s time for a new parody video for it! I decided to try out a female voice for this video. I may experiment with other voices in future videos. Let me know what you think! Just turned on Apple’s Genius feature in the iPad App store. Getting all kinds of odd recommendations. 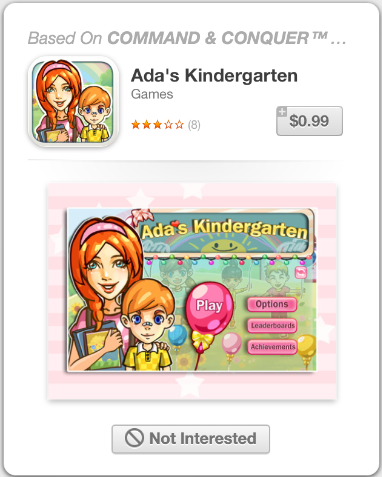 Because I purchased “Command & Conquer”, it’s recommending Ada’s Kindergarten? 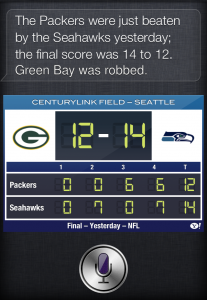 Not really tech news, but it involves Siri, so why not? 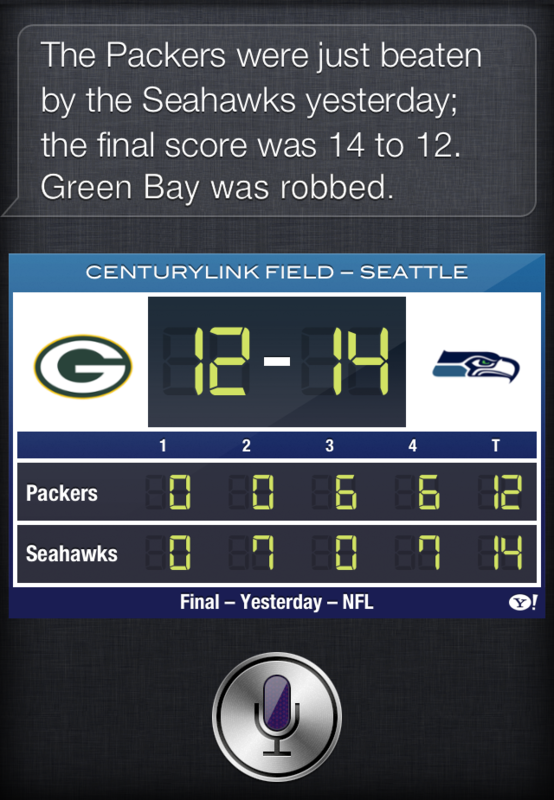 Siri agrees that the Greenbay Packers were robbed of a win by the Seattle Seahawks (and the replacement refs)! While the previous video was made before the iPhone 5 was released, this one was made after it’s release (hence the footage of fans lining up for the iPhone 5). A lot of people were expecting more “innovation” from Apple, and there seemed to be a sense of disappointment that the iPhone 5 wasn’t “new” enough. I decided to build off that theme for this video. Enjoy! This video was created to combine the popularity of PSY’s Gangnam Style video with the launch of the iPhone 5. In order to launch the video on time (just before the Sept 12 launch), I had to use mockups of the iPhone 5 that were posted online. I was also betting that the device would actually be called the iPhone 5. Fortunately the mockups were pretty close to the actual look of the device, and thankfully the device was indeed called the iPhone 5! I created this video as a take on the recent victory by Apple against Samsung in the court room. Apple is fiercely protective over their ideas, trade dress and of course patents. The reaction from Samsung (and Android supporters) is that the victory is unfair since “you can’t patent rectangles”. Well the bottom line is that Apple was able to patent what they did (fairly or unfairly) so the real question should be whether such patents should be allowed in the first place. I’m sure this is not the last battle between them, so it’ll be interesting to see how this all plays out over the next few months.